Cartrophen is the only medication that I know of that does not have any listed side effects. It is safe for patients that are older, have other illnesses or are taking other medications. 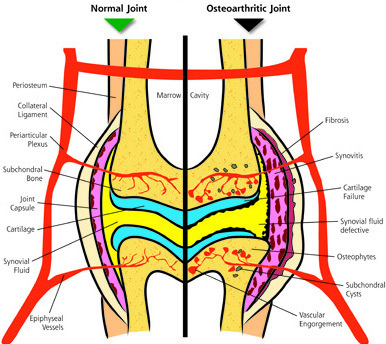 Firstly Cartrophen increases joint fluid which lubricates the joint. This decreases wear and tear on the cartilage surface by decreasing cartilage contact and friction. In turn this provides considerable pain relief as these surfaces are not contacting each other. Secondly Cartrophen stimulates cartilage to heal. When the cartilage repairs it fills in the ulcerative surface to become more smooth. When the cartilage surface heals it becomes more comfortable. Thirdly Cartrophen stimulates blood flow to the joint which brings oxygen and nutrients and removes toxins. These are needed for a healthy joint. Fourthly and very importantly Cartrophen blocks the release of enzymes into the joint that causes arthritis to get worse. This is important to remember as arthritis generally is a progressive disease that gets worse every year. The use of Cartrophen has improved many of our patients lives. Because of the pain relief that occurs pets are more active, happy and have a better quality of life. Cartrophen is indicated for use in both dogs and cats.